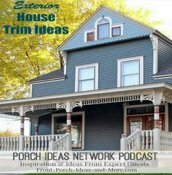 Welcome to our audio programs where we feature informative interviews with experts about creating a wonderful porch and yard - plus DIY projects. We invite you to subscribe to our podcast on iTunes or Stitcher Radio. 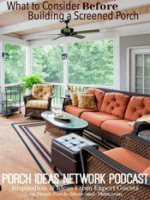 38: What is Better than a Screened Porch: We Tell You. 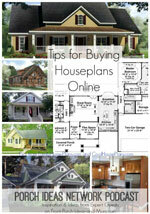 Jarret Magbee, CEO of Family Home Plans, enlightens us about purchasing stock houseplans online. Learn about today's trends, what you should know before getting a house plan and the kinds of modifications you can have done. Shawnna Steele, owner of ReDesign HP, gives us an insider tips to modifying house plans. 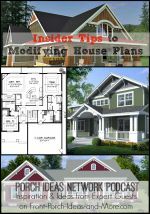 Learn about the modifications that she most often sees and why you should focus upon the floor plan more than exterior when deciding upon a plan. 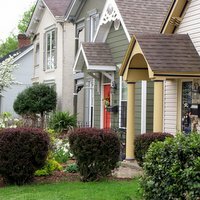 Bruce Goodman and Leisa Collins share their knowledge about the Arts and Crafts Movement and the beautiful architecture of Craftsman Style homes and porches. Especially bungalows! 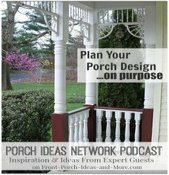 Our guest, Gregory Tatsch, founder of Vintage Woodworks, knows that great front porch designs happen through careful planning. Part 1 of a 3 part series. 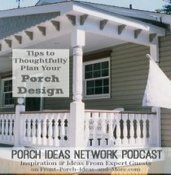 Our guest and sponsor, Gregory Tatsch, continues his discussion on planning your porch as he speaks about the structural components of the porch roof, floor, posts, beams and ceiling. Part 2 of a 3 part series. 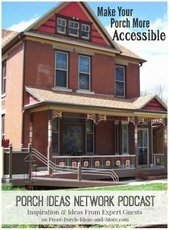 Our special guest, Gregory Tatsch, founder of Vintage Woodworks, shares how decorative porch parts can make your porch extra special. Part 3 of a 3 part series. What's Better than a Screened Porch? Caison Craven, Operations, Operations Manager at DIY Eze Breeze, shares wonderful tips for adding windows to your porch. 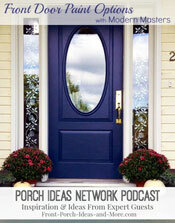 Nancy Moore, Founder of The Porch Company, has some excellent practical suggestions for planning your screened porch. 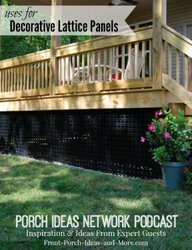 Our guest, Glenn Smith of Screen Houses Unlimited, tells us about several options for screening your deck, porch or patio with a screen porch kit. Kits range from seasonal to permanent or "walls only" and are DIY friendly! 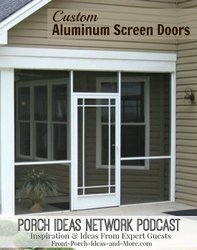 Steve Pfeffer, President of PCA Products, tells us about the custom aluminum screen doors that his Tennessee company manufactures. Each one is handcrafted. We enjoyed hearing how his doors help solve common problems. 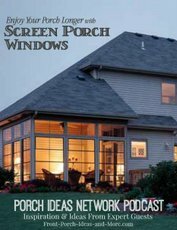 Our guest Sean Laker of the Rekal Company talks about the benefits and features of screen porch windows. No more storing and lugging out storm windows for your porch. Color expert and strategist, Lori Sawaya explains color concepts to us. Very helpful tips I wish we had known sooner! 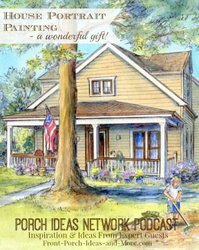 Our friend and realtor, Jeannie Timmons, gives us her best tips for staging your porch to sell your home. 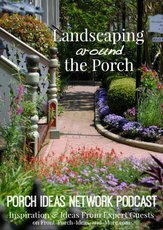 Jeannie shares stories that will open your eyes to the importance of the front of your home. 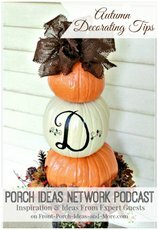 Our friend and guest, Jennifer Davenport, gives us several great ideas for decorating our porch and outdoors for Halloween. Halloween is a favorite holiday of her family and you will hear why! 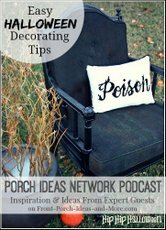 We welcome Jennifer Davenport, an Interior Decorator, who shares simple yet memorable ways to spruce up your porch for autumn. Jim Rogers, President of Modern Masters, shares an interesting story about how his company, Modern Masters, evolved and why they created a paint that is formulated for the front door. Moises Cruz, Principal Structural Engineer at A-1 Engineering explains why foundations crack and what that means to homeowners. 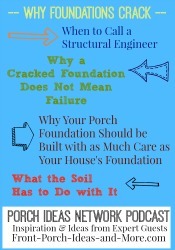 Learn why it's important to consult a structural engineer before you call a foundation repair service. For an updated look to your home and porch, consider non-traditional porch railings in stainless cable or glass. Enjoy a much fuller view when you sit on the porch. 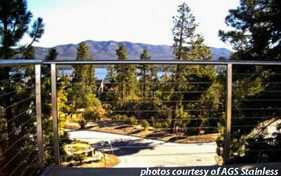 Our guest Kevin Harris of AGS Stainless explains why these railings are so popular now. If you want to extend your porch for extra outdoor living space, we have some affordable ideas to get you thinking. Sometimes just a little more outdoor space makes all the difference. 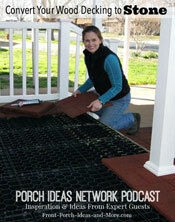 The folks at Behr give us tips for painting and staining your porch or deck floor. 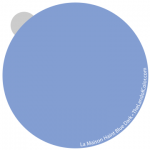 They help us to understand how to select the right paint or stain for your outdoor spaces. Marc McAvoy, Founder of Acurio Latticeworks, tells us about the many practical and creative ways to use decorative vinyl lattice panels. 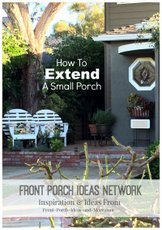 Of course, porch and deck skirting are two of the uses. But, there are plenty more. Zach Watson of Embers Grill and Fireplace Store tells us about the popularity and allure of amazing fireplaces and kitchens in outdoor spaces. 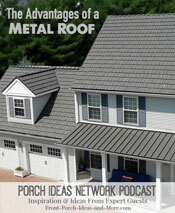 Bill Hippard, President of the Metal Roofing Alliance, shares the advantages and joys of having a metal roof on your home or porch. We were amazed at how far metal roofs have come. They are beautiful and come in so many styles now. Our guest Bart Stuchell, President of Silca Systems®, shares about his revolutionary product that enables you to transform your wood porch flooring into stone with an easy DIY system that he invented. 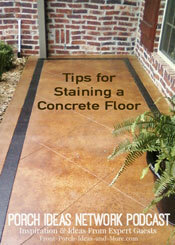 David Goddard of Goddard Designs has his own business staining concrete and he offers helpful concrete staining tips that you will want to hear before you begin. 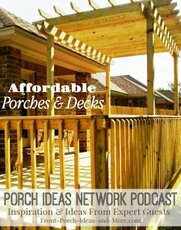 Our guest, Bradley Johns, founder of Ready Decks, talks about the affordable porches and decks his company builds for both mobile homes as well as traditional homes. In a day, you can have your deck built! Our guest, Tim Peele, owner of The Mobile Home Parts Store, talks about ways to enhance the look of your mobile home. 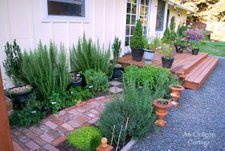 Our guests, Jami and Brian Boys explain their awesome backyard makeover that includes a wonderful herb garden, meandering walkways, a gazebo and beautiful outdoor eating area. 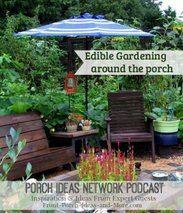 We welcome Troy Marden, a host of Nashville Public Television show, Volunteer Gardener, who shares helpful tips for planting edible and ornamental plants in your modern landscape design. 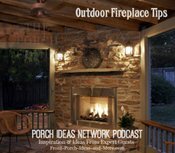 Suzanne Taylor of Taylor Made Contracting discusses attractive ways you can make your porch more accessible for people of all ages. We welcome Anita Diaz, author of Far Above Rubies, who shares her decorating ideas for a memorable country Christmas! We welcome Jennifer Davenport of Jennifer Decorates. 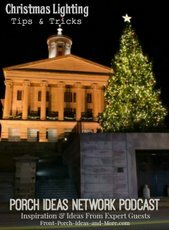 She shares some of her favorite Christmas decorating ideas! 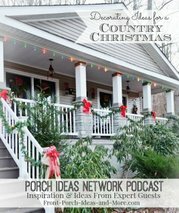 Dave and I know you don't have to spend tons of time or money for a charming Christmas porch! We welcome Becca Dorstek, a self-taught photographer from New York. She gives her best tips on photographing Christmas lights in the evening! 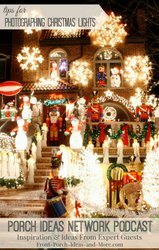 We welcome Bob Lyons of Outdoor Lighting Perspectives who shares some fantastic lighting tips and tricks for Christmas that will help you from going bonkers this holiday season! 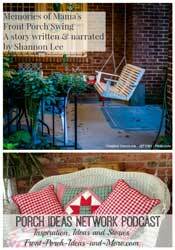 We are honored to have Shannon Lee, a professional writer, narrate her own story about her special memories of the front porch swing. We are honored to interview Trevor Crafton and Linda Lytle of Madison, Indiana, a wonderful porch town on the Ohio River.